This is a guest post by Lee Bell. Lee has a MSc in exercise physiology and is a consultant lecturer, speaker and content writer. He is a published academic and professional writer and has delivered talks at a number of conferences including the COPA Growth medical conference in London. He is also involved in primary sport science research with other sport scientists across a number of institutions and is currently looking into neck health strategies in Rugby. 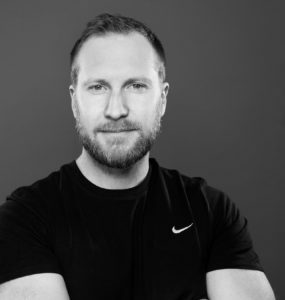 He has lectured in sport science for a number of years and has also delivered training to hundreds of personal trainers and coaches as master trainer for a number of global equipment suppliers as well as fitness education providers. You can find more of his writing on his site The Muscle Mechanic UK. With advancement in healthcare systems and integrative technology, the number of older adults populating the earth has gone up dramatically. Since the 1970s, we’ve seen an exponential number of people reaching 60 years of age or over and around nearly 15% of the population are currently aged 65 or over. Even the number of adults achieving the age of 90 is increasing. But with ageing comes the inevitable loss of function and a gradual (and sometimes steep) reduction in physical function and health. And one such age-related illness is that of sarcopenia – a disease characterised by a loss of skeletal muscle. Over the last few years a small number of interventions have been put forward for the treatment and management of sarcopenia. These include strength training, protein intake and light-load resistance exercise such as occlusion training. In this article we’ll take a look at creatine supplementation and see if it might play a role in health improvement in older adults. Sarcopenia refers to the age-related loss of skeletal muscle mass. It has a direct and negative effect on muscle strength (which is often referred to as dynapenia in the context of age-induced loss), body composition, injury risk and metabolic health. It is estimated that from the age of 50, muscle mass decreases by around 1-2% per year, with muscle strength decreasing at a slightly quicker rate . For adults aged 60-70, prevalence of muscle loss can be as high as 13%, and if left untreated, by 80 years old, it is possible for an older adult to have lost as much as 50% of their skeletal muscle mass. That’s an absolutely huge amount, and as you can imagine, is debilitating. There are a number of factors that affect muscle loss. These range from factors such as poor diet and sedentary lifestyle to drug use and chronic disease . And the real life implications of this are wide bearing. Ultimately, sarcopenia is a condition that has a drastic, downward-spiral effect on health, independence and quality of life if left untreated. Muscle is the key to movement. Being able to complete functional tasks boosts independence, well-being and longevity are all dependant on having the necessary strength to perform movement-based tasks. On a cellular level, sarcopenia is characterized by a loss of muscle cells and a concurrent increase in intramuscular fat. Sarcopenia sufferers experience a marked reduction in satellite cells and neuromuscular junctions primarily in their type II fibers. Inevitably, this can have a negative impact on muscle strength and the ability to complete everyday tasks. And as weaknesses sets in, older adults can quickly lose their independence and become isolated through lack of ability and confidence. Whilst there is no one reported mechanism for how sarcopenia occurs, a number of contributing factors have been suggested. These include decreased protein synthesis rate (anabolic resistance), a shift in muscle-fat ratio, increased proteolysis and a significant drop in neuromuscular integrity . Sarcopenia should be suspected in any older adult (>60 years old) who doesn’t meet minimum physical activity guidelines. A quick and simple test is to assess muscle weakness is sit-to-stand task ability. If the task is difficult, then a follow up, clinical diagnosis is recommended. One diagnostic tool is an SMI (defined as the appendicular skeletal muscle mass/height²) of under 7.26 kg/m² for men or 5.45 kg/m² for women . Another diagnostic tool is a calculation of percentage skeletal muscle mass (total muscle mass/weight × 100). These are typically assessed using a DEXA measurement. Fixing the Problem: Is there anything we can do? Although ageing is an inevitable process, it doesn’t mean that we can’t improve quality of life in older adults by offsetting the decline in muscle mass. It is even possible with the correct strategies to improving it. And one possible intervention that may help to boost muscle mass, strength and independence could be that of creatine supplementation. 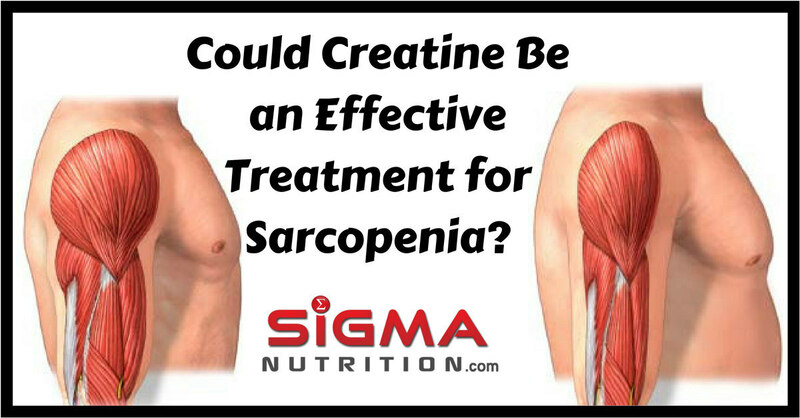 Creatine Supplementation – A Novel Intervention for Sarcopenia? As you’ll be well aware as a regular listener of the podcasts/reader of this website, creatine provides rapid energy substrate to skeletal tissue, and by doing so assist in athletic performance. That part is pretty much unquestionable. It does so via a number of mechanisms including augmentation of muscle strength and power output, high-intensity tolerance and cognitive abilities amongst many other performance-related variables. Creatine is one of the most popular and robustly studied supplements in athletic populations. Its efficacy is pretty much undisputed. Emerging clinical research suggests that creatine supplementation might not just be for athletes as it may also be an effective treatment for sarcopenia. It has been shown to improve musculoskeletal health by increasing functional strength, increasing resistance to fatigue and improving the ability to perform active daily living tasks. And although a number of mechanisms by which creatine might offset muscle loss in older adults, the most likely seems to be that it is closely related to creatine kinase (CK) activity, and thus can potentially help to elevate muscle strength and endurance. Because creatine is stored mostly in skeletal muscle tissue, a loss of muscle means a reduced storage capacity for creatine. Essentially, less muscle means less creatine. And more muscle mass means potential for more creatine. creatine has a direct impact on immediate energy provision, this too will be affected. The main difference in age-related absorption of creatine, is that intramuscular content does not increase at the rate of a younger person . Older adults just don’t seem to take it up into tissue as younger adults will. One research study that discussed current theories relating to creatine therapy for sarcopenia suggested that because of decreased absorption, “ timing and dosage of creatine supplementation may be important factors for ageing muscle accretion” . The authors went on to offer that the long-term effects of different creatine application strategies on ageing muscle are relatively unknown, but that different dosing and timing may be important factors as well. Another study went as far as saying that the actual timing of creatine supplementation may be more important than total intake. And that current evidence points to ingesting the compound proximate to resistance training to maximize tissue absorption . There are an ever-increasing number of studies showing that adding creatine supplementation to a strength training program can improve lean mass and delay sarcopenia-related muscle loss. A 2016 study published in the Journal of Cachexia, Sarcopenia and Muscle  found that when combined with a 12-week strength training program, 5 g per day of creatine monohydrate significantly boosted lean mass. In the study, participants were asked to take part in a general resistance training protocol involving major muscle groups. Some of the group were asked to take creatine and others were given a placebo. After the study period, the creatine group showed an improvement in lean mass and SMI. And although there were no positive changes to muscle strength or bone mass, this was considered an important step forward in treatment options for sarcopenia. Similar results were seen in a study of vulnerable, older women too . Published in the journal Experimental Gerontology, the 24-week double-blind study saw a group of 60 women given either creatine without strength training, creatine in combination with strength training, placebo in combination with strength training or placebo alone. Although bone mass or fat mass didn’t change, 1RM leg press strength increased in the creatine and strength training group as well as appendicular muscle mass (+1.31% compared to -0.2 in the placebo and strength training groups). Interestingly there was a small increase in lean mass with the creatine only group who didn’t participate in strength training (+0.3%). Although the research is by no means unequivocal, some studies have shown that creatine supplementation without concurrent exercise training could improve symptoms of sarcopenia. Moon et al. found in their review study that even in the absence of resistance training, creatine supplementation did improve functional capacity in terms of muscle strength, endurance and lean body mass. The review also stated that although there were exceptions, creatine supplementation was more beneficial in larger muscles and less effective in smaller muscles. That said, whilst these results are promising, there’s no doubt that combining creatine with a strength program will bring about better results. As with most interventions, it’s worth looking at what pooled statistics from meta-analyses and systematic reviews say. That way we can assess the weight of evidence and external validity. One such study, published in Medicine and Science in Sports and Exercise , suggested that adding creatine to a resistance training program was an ‘encouraging’ area of research. The analysis, which included 357 older adults, reported significant and positive changes to total body mass, fat free mass as well as strength in chest press, leg curl and a 30 second chair stand test too. Creatine supplementation in the elderly is without a doubt an interesting area of research. And whilst there’s still much research left to be done, it may provide a useful tool for management of sarcopenia going forward. Side Note from Danny: If this topic of sarcopenia is of interest to you, Dr. Brendan Egan talked about the concept in episode 87 of the podcast.